You might be asking yourself, well $800-ish seems kind of pricey, what do I get for that money and why do I want this small, but built like a brick sh*thouse box in my kitchen? It only makes three drinks, really after all, and doesn’t even come equipped with a milk frother or steamer. What is the actual point of it? Well, Know Your Grinder is on hand to go through some of those reasons – as we have just mentioned some of the potentially less convincing aspects of it (although those will also be delved into properly soon enough). First off, let’s take a tour of the Jura Ena. Standing a little over twelve inches in height (ie the same as an LP if you’re ancient – or hip – enough to still own a record player) this is not exactly a huge piece of apparatus. But what it lacks in height it makes up for in weight – be warned, this is heavy. Jura wanted to create the smallest unit possible for making a completely fresh cup of coffee, straight from freshly ground beans. This means, there is a tantalizing mixture of the extremely complex and the very basic on this machine. Yes. It has all the programmability you would hope for, of a machine of this caliber (and price tag!). But there are no pods with this. No K cup integration. This device is here to grind coffee, although you can also opt to use your own ready ground or of course packet bought grounds. Constructed out of the same material that airlines use to make their black box flight recorder with* (*this may not be strictly true). This little baby is not going to fall apart any time soon, and will, we feel, still be brewing up at the bottom of the Indian Ocean, were it to be dropped in there. In other words it is SOLID; a small but extremely robust gadget that will not over occupy your counter space, jealously coveting the patch by the microwave or attempting to annex Poland. It should be fine tucked away somewhere in a corner, just discreetly turning out truly excellent coffees. Another piece of good news for caffeine fiends impatient for their morning fix – this is good and quick. It can go from bean to cup in approximately five minutes. Which is pretty good going if you ask us. Essentially, this is a far simpler operation than a lot of pod machines are. It doesn’t make everything from lapsang souchong to Belgian hot chocolate. This machine is there to facilitate one thing and one thing only: coffee. There are three drinks it performs. 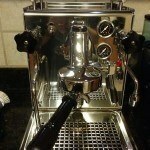 Primarily, we would look upon this as being for lovers of espresso firstly and foremost. 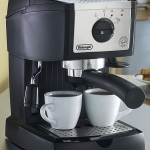 This makes an excellent espresso, straight from the bean, quick and easily at the touch of a button. It can also do ristretto and simple coffee/ Americano. There are a range of heights it can accommodate, from 2.5 to 5 inches tall, as well as being able to select the strength. Choose from five grinder settings and two dosing sizes. More good news comes in the form of automatic flushing and cleaning technology. 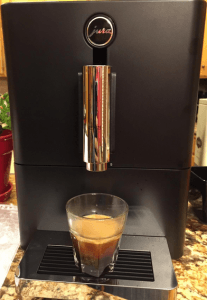 If, like us, you wake up perspiring at in the middle of the night at the thought of having to de-scale your espresso machine, then you could be in luck. It can be used with a filter that should avoid this fate, but compared to some machines, is not too scary and tablets to work with it, can be purchased. Now, the slight downside is that buying all the tablets and whatsits to keep this functioning at tip top condition is not going to be exactly cheap, but it is, we feel, worth it in the long run. There’s a lot to like here. High quality coffee and espresso, particularly, straight from the freshness of the bean. You can change the size of the cup, the strength, you can change the grind type. It actively helps you with maintenance by performing a service flush automatically. You will be prompted/ helped through the de-scaling process. It is helpful, informative and above all, not that big. Better still, it still works out cheaper, all in all, than a pod machine and with less waste and eco doom too. 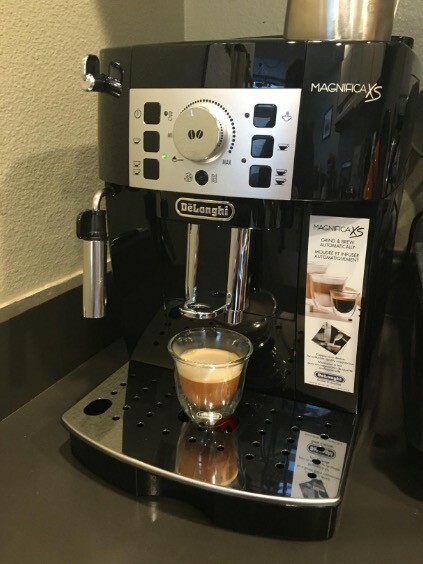 For lovers of great espresso, who don’t want to do all the fiddly bits themselves and just have fab coffee with a minimum of inconvenience, it is definitely a machine to have. WHAT’S NOT SO GREAT ABOUT THIS MACHINE? First major downside to this is, if you’re a fan of cappuccino, lattes or any milk-centric coffee, you are out of luck. There is no steamer or frother with this unit. Some people may take this as a bad thing, although most customers attest to it being just fine to use with microwaving any necessary milk. Of course, that’s just not the same, we know. Second point is the obvious price tag. This is seriously not cheap at around $800, depending where you buy. Also, all that maintenance and care is similarly not going to be light on the wallet. All the same, many happy owners are still pleased with it and if your only alternative is a hefty Starbucks habit, you will still be quids in. It also still beats pods for economy of use – as well on freshness of taste, many feel. There may have been one or two discontented murmurings about the customer service from JURA, but then again, there are plenty whom have had a good experience and the warranty does extend to a full two years. 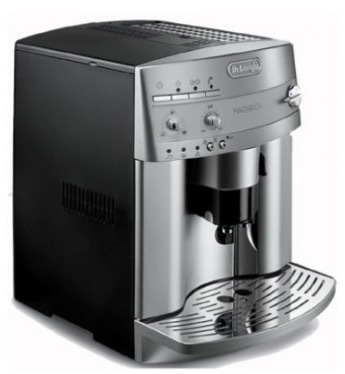 In short, this a great-looking specialized coffee and espresso maker, for lovers of espresso, who just want a cup of excellent coffee – fast – and with a minimum of messing around on a morning. It also looks extremely cool and, like we said, will probably outlast most of your other household appliances. On a related note, if you’re looking for a Jura and the pricetag is just too much for you, there are sometimes Jura espresso machines available on Amazon which are certified refurbished units, which often come as a better deal. 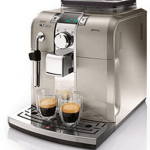 Click here to check for refurbished Jura models on Amazon now. I just read your great review on the Jura ENA Micro 1. Thank you for posting! It looks like Jura replaced (and improved) the ENA Micro 1 with the A1 in 2016 in other countries. Do you know if the A1 will be available in North America anytime soon? Unfortunately, that does not seem to be the case. I just spoke to someone at Jura on the phone (Late June, 2017) who told me that there are no current plans of which she was aware to bring the A1 to the US. While the A1 does have some “improvements”, it really does spec out virtually the same as the Micro 1. May be wait until the holidays to see what the deal is?